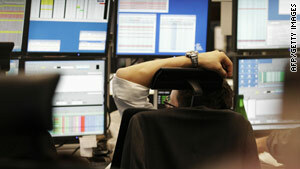 A bank trader slumps in his chair during the trading day at Germany's stock exchange in Frankfurt on May 10, 2010. (CNN) -- The European Commission outlined its proposal Wednesday for a number of national emergency funds designed to take the pressure off taxpayers in the event of any future bank failures. There are different proposals from different parts of Europe. Wednesday's proposal was from the European Commission and it is called the Bank Resolution Fund. EU Internal Market Commissioner Michel Barnier unveiled a plan to raise money from the banks to establish a network of funds held at national level to only be used once it has become clear a bank will fail. He stressed that it was not a rescue or bailout fund. Barnier said the cash pots would cushion taxpayers against any future bank failures, by preventing the need for economics to race to the rescue of troubled institutions. The funds would be just one element of a broad new framework to prevent a crisis in the banking sector spilling over into the economy. The commission would like this fund to supersede any plans by national governments to levy taxes on their own banking sectors. The initial suggestion from the commission is that the funds would cover deposit-taking banks and investment firms. It said it would consider later whether the umbrella should be extended to other financial companies whose collapse could create wider turmoil for the economy. How much money would be in the fund? It is not clear at this stage. In the statement, the commission said the "size and scope" of the funds would "depend on the efficiency of improved supervision and regulation." It said it wasn't the commission's intention to offer precise detail about how the funds would actually operate. Estimates being suggested range from $23 billion, which would amount to a small levy on each bank, to $120 billion, according to Deutsche Bank. The reason for the vast difference is that banks will be forced by law to pay into it. Pitching the size of the fund towards the smaller end of the scale could be enough to restore confidence without imposing on bank profits. However, others say that to raise enough money to make a difference, the fund would have to make a serious dent in bank revenues which could reduce bank profits. The British government has made clear it doesn't want a central fund run by Brussels that national governments would be free to tap in times of crisis. The idea is that 27 separate funds would be created to reflect the size of each country's banking sector. The French government seems to favor a plan to tax "practices" so the riskier the bank the more money it pays into the fund. The banks of course don't want to be taxed on their particular activity. Some people wonder aloud if a bank would take more risks if it knows its eventual failure would be absorbed by a pot of money already raised. The European Council (heads of State) would have to approve the proposal, along with the European Parliament. The G-20 is expected to discuss the proposal at its Toronto summit in June. But there is no way to know if this kind of fund would be adopted beyond Europe. The G-20 is looking seriously at various forms of "recovery and resolution plans." The commission wants this in place by October when a timetable to start taxing the banks would be unveiled by the European Union, and it would be up and running in early 2011.